With the Gigabyte GA-Z270MX-Gaming 5, I created my very own highend 2017 Mac Pro with the coolest looking case from Phanteks, the Ethoo Evolv Tempered Glass mATX Case. It’s smaller footprint compared to normal sized cases is why I went with the GA-Z270MX-Gaming 5 motherboard along with it being one of ahte coolest looking motherboards available for Kabylake. This is a simple copy paste guide to getting a working GA-Z270MX-Gaming 5 Hackintosh Build. I prepared the EFI Folder for you all you have to do is replace the one created with Clover with the one I made this will enable you to install macOS on this motherboard and have working sleep, graphics, sound & ethernet. I wrote a previous build guide on the Gigabyte ultra durable series GA-Z270M-D3H Hackintosh Guide. The higher end series boards use a better audio chipset the new ALC1220, which has better sound quality than it’s predecessors the ALC892 and ALC1150. This hackintosh build guide can be used for most of Gigabyte’s Gaming 200 series motherboards and was tested using Sierra 10.12.4. Sleep/Wake, Graphics, Ethernet and Sound all work without any issue with this hackintosh build guide. Let’s turn your own into a high end Mac Pro hackintosh. This guide was made for Sierra 10.12.6. If you are installing High Sierra 13.x follow the High Sierra Guide instead or follow this guide update the kexts once you download the EFI folder in step 3. If you follow the High Sierra Guide you can use the BIOS settings from this page below to quickly find what you need to change when you get to that step. To install macOS Sierra you will need a macOS Clover Bootloader. To create one follow the How-to Make a Clover Hackintosh Bootloader guide. This is the part where the EFI Folder created with clover is replaced with the hackintosher.com GA-Z270MX Gaming 5 version. Most people will be using this motherboard with a seperate graphics card, however for those who want to use the integrated intel iGPU they will need to change the default config.plist to the iGPU version. Follow these steps only if you arn’t using a dedicated graphics card and instead relying on using the Intel integrated HD530/HD630. Restart the computer and rapidly press the DEL key on your keyboard to enter the BIOS. You’ll be booting form your USB flash drive until clover is installed onto your boot disk in Step 7. Therefore it will need to be set as the primary boot device until that happens. You must boot using your USB flash drive until an EFI folder is created for your Boot Disk. Therefore your flash drive will either need to be launched as a temporary boot device or set as Boot Option #1 in BIOS. The next step is to install macOS and transfering the EFI boot partition of your flash drive to your disk drive. Follow the general Installation Guide then return to this guide when done if you have never installed macOS with Clover before. To fix occasional restarts instead of shutting down on any gigabyte motherboard the fix in config.plist by setting FixShutdown_0004 in apci under fixes. Sound – AppleALC.kext v.1.1.0 with Audio Inject: 11 & Lilu.kext v.1.0.0 – This motherboard uses ALC1220 was gotten working using AppleALC.kext and Lilu.kext with Audio Inject: 11, beware the latest versions of AppleALC.kext and Lilu.kext for they will break video playback and sound. If using either of the kexts stick to the version used in the EFI Folder which is AppleALC.kext v.1.1.0 & Lilu.kext v.1.0.0 released on Feb. 22 2017, until the developer of these kexts fixes these issues. If you are followign this guide with a motherboard that has ALC1150 or ALC892 then you need to change the Devices > Audio Inject to 1, which can be set in the config.plist of your EFI/CLOVER folder using Clover Configurator. 206 Comments on "Gigabyte GA-Z270MX-Gaming 5 Hackintosh Build Guide"
Will this guide work for a mITX GA-Z170N Gaming 5? Been having a hard time getting this mobo to work with the standard guides. Wont hurt to try this guide is much quicker than others. The only thing I see you needing to make it changes the AUDIO ID in config.plist under Boot > Devices to 1 above Inject to get ALC1150 working since this guide uses ALC1220. Yes, it will work just fine from looking at it. Keep getting “Missing operating system” when adding usb stick. Same build, different graphics card. A. You need to boot from the UEFI partition of the USB Stick. B. EFI Folder must be on EFI Partition C. Boot from UEFI must be enabled in BIOS. Hmm.. and when the BIOS screen posts have you pressed F12 to choose a temporary boot device and then selected UEFI: (Flash Drive Name) or is that not showing up for you? Also are you using F4 BIOS version? Are you able to make it to the Clover Boot Screen? Look at the image at the bottom of Step 2, substep 5 “Paste the copied EFI at at /Volumes/EFI” that’s where you made your mistake. Hmm… yes you did it wrong, I guess I need to make the guide clearer. Your suppose to the put the EFI Folder in the EFI Partition where BOOTLOG is, not Install macOS. Also delete the file called BOOTLOG. I’m glad your issue was an easy fix. Something seems to be missing, I can’t mount the EFI partition in the way the instructions want me to. Click update partitions at the top. I was erasing my USB stick from the partition instead of from the actual stick (I didn’t get the GUID partition list as a choice). Redoing things with the actual stick selected got me the EFI mount and things are moving along now. Thanks so much for your help. Hi, which BIOS do You use? Everything else was done as to your manual, and it get freeze on the 2/3s of the installation screen (with the apple logo and the process bar). I am really frustrated at this point and any help would be very appreciated. Would be really cool for other if OP could update the EFI folder with up-to date files, as Intel HD grahic drivers has been changed in 10.12.5. I’ve updated the guides downloadable EFI accordingly thank you for being helpful. 1. Could not get the sound working 🙁 I suspect there are other kexts need to be updated. Tried solution here: https://www.tonymacx86.com/threads/quick-fix-200-series-kaby-lake-audio-onboard-and-or-hd-6×0-hdmi.221618/ but it did not work. Probably because I am using 6600k with Z270. Your Help would be really appreciated. 2. Found out through reading the posts, that setting darkwake=8 at the boot menue of the clover editor makes MAC come back from deep sleep. In you configuration it was set to 1 and if the sleep was deep it did not come back, but went into restart after some seconds of black screen (when you hit any button on keyboard to wake it up). All in one, as you are much more experienced, would be great if you could redo your EFI for 10.12.5 with Graphics and Sound patches. I’ve been using 12.4 let me update to 12.5 and get back to you. 1. Updating Lilu.kext & AppleALC.kext will cause blackscreen/no audio on some gigabyte motherboards, not sure what the cause of this is, but I was able to get around it. 2. Darkwake = 8 wont make a different if you are using a gigabyte motherboard, it should wake regardless. Also wake from sleep wont work on integrated skylake/kabylake graphics so changing darkwake wont do anything in your case. I was able to successfully install 10.12.5, get integrated graphics working, sound, and wake with a dedicated graphics card. I did this on a Gigabyte Aorus Z270X-Gaming K5 which is very similar to a Z270MX. Please test this new EFI folder below and tell me if it works for you so I can update it for everyone else. Don’t forget to rename config-iGPU.plist to config.plist if you’re using the integrated iGPU only. Also, I need to mention this since you used that tonymac script AppleALC may no longer work as you ended up patching your AppleHDA file so you will need to either a. Replace it with a unedited version of AppleHDA or b. Reinstall a fresh copy of macOS on a new partition. The error seems to be independent of what hard drive (I’ve tried two different SSDs) I use for the install procedure, so I suspect it might have something to do with my bootable media. It looks like someone on the tonymacx86 forums experienced the same problem, but no one seems to have provided any insight on the issue. I’d appreciate any ideas you might have. Also, thanks for the great tutorial! I suspect this might be a similar issue to what Igor pointed out yesterday. I set up my boot media earlier in the week so the EFI folder I copied over may not have contained the updated kexts for 10.12.5. Given that you uploaded a new EFI zip folder recently, I’ll recreate my boot media to see if that fixes the problem. I’ll let you know what the outcome is! I just added the IntelGraphicsFixup.kext and updated your Lilu.kext with the one provided in the link and everything went smoothly. I’m using a Steinberg Ci1 usb audio interface connected to my studio monitors and I seem to be getting interference noise when I play audio. I plan on trying out a different audio interface to see whether it’s a compatibility issue. I’ve noticed that you’ve got a few extra kexts in your revised EFI folder. What’s the best way of getting these into my new system? and then test to see if it works well. If it does you can then backup your current EFI and paste this on on the EFI of your hard drive. and it works like a charm. I have sound working from the frontl panel of my Raijentek STYX and the back of the Board , so feel free to update the main article! One thing that does not work though is the Audio through DisplayPort to my LG Monitor. It does not seem to detect that output at all. On my MBp its works flawlessly. Any idea why? P.S. Thanks again for your great work. Your tutorial was the easiest to understand for a Hackintosh beginner like me, and I hope you will update the Gigabyte Z270MX / X tutorials as the OS updates! Yea, you have to follow this guide for HDMI audio, but some pascal cards still have trouble. You will need to use an displayport cable and have to experiment with each displayport as some people have said only one port produces sound while the other two don’t. I have read that article, but it seems to be focusing on the audio pass-through with Nvidia cards. At the moment I am trying to deal with the Intel integrated graphics. You can start by looking at https://github.com/toleda/audio_CloverHDMI but I would backup your EFI folder by zipping it before experimenting with that and I would also try getting it working on a new macOS partition to prevent it from messing up your audio on your main mac partition if it doesn’t work. P.S. I’ve isolated my the noisy signal as a ground loop issue between my PC and my monitors (not software related) – so I should be able to get it sorted over the coming weeks. SUCCESS!! Killer Gaming Mac Pro! z270x gaming 5 , i7 7700k ,16gb 3200 ram Aorus GTX 1080 ti, dual boot with win10, 250 gb 960NVe SSD (win 10) , 240 gb SANDISK Plus Internal SSD (sierra) Hackintosher thanks man very helpful article! Almost everything works as excepted but there are still a few things that need tinkering. What I got working following this article is gtx , hd graphic, sound, icloud, all the usb ports sleep and ethernet . The first problem I have encountered is with the wifi/bluethooth card that came with the motherboard Gigabyte GC-WB867D-I. The wifi wont work on it but the bluethooth does. Its quite important for me as I got me speakers connected with bluetooth. The problem is that sometimes after restart it does not engage at all and you see no devices to connect. It comes back after a few restarts. Is there any workaround on it so that it will stay solid all the time? Sleep/wake doest work only on the gtx but not on the HD. Hibernation however did not so I simply disabled it in the terminal. The i message is not working just yet but I have just found an Idiot`s guide to imessages and will follow it. How did you get it working yourself? The next minor thing I have notice is that on of the jack port for my heads set on front of my case is not working. Sierra does see the headphones when I plug them but there is no sound going out. Rest of the sounds port work fine though. That port did however work when I installed sierra with a different method(hackintosh-sierra-h270n-wifi) I am sure that it also can be sorted. The last problem I am experiencing is my wifi card TP-LINK 300 Mbps TL-WN823N. I used the vendor`s online BETAweb drivers for macOS and it does work, however it hangs from time to time and needs to be simply turned off and on again. For everyone considering similar rigs I would suggest to purchase an apple supported wifi/bluethooth card so that it will work out of the box without issues. Any suggestions Hackintosher ?? I was looking at one from tony86 forum but its only available in US and not in UK. USB Wifi/BT wont work reliably you will need to get a DW1830/DW1560 or something mac/hackintosh compatible. For headphones over ALC1220 on the front port I’ll look into it. Hi! Will Gigabyte Z270X-Gaming 7 work with this guide? Yes, but audio likely wont work because of the Creative Sound Core 3D chip that motherboard uses. You’ll need to get a soundcard/USB Dac. Also you will need to add IntelMausiEthernet.kext for the second LAN Port on your motherboard. Okay cool so all you have to do then is use your speakers to control volume as an alternative. Hi, thanks for this easy step by step guide, I was wondering if this guide will work for the Z270X gaming 5 motherboard? Your kexts and other uploads will work with this motherboard also? Yes absolutely it will work. What is your boot time with this? (From pushing power button to desktop screen) I consistently get 25-26 sec boot time. Is it normal? Depens on from where you count. UPDATE SUCCESS! z270x gaming 5 i7700k Aorus GTX 1080 ti. *front panel headphones audio port sorted. I had to add a patch in clover and change audio value to 1. It works smoothly except when you increasing or decreasing the volume it self, it lags a bit but then it stabilises once you finish adjusting the volume. Nothing major though. What patch did you add so other people know? I myself haven’t had any problems with front headphones. 1) Clover Add patches in DSDT if not present. Okay I see, yes that patch is already in the config.plist of this guide. I see that you are also using an ultrawide Monitor. While my LG38″ works like a charm on a standard resolurion, I am missing HiDPI scaling above 1920p in the menu. Do you have am idea how to fix that? I have tried several programs and methods, but nothing worked as intended. On a sidenoe, HDPI scaling the same monitor with MBp 2015 works like a charm. Hold down the alt key and press “Scaled” in Display System Preferences for a list of HiDPI options. Hi, amazing guide, thank you! I have a Gigabyte Z270x-Gaming 5, I7-7700k, 32GB RAM, PNY 980 Ti 6GB Graphics. I connect to the monitor with a Display Port cable – yes I am in the graphics card and not the mobo! I get the Apple logo on the screen, then the progress bar appears, fills, then BLACK…. Sometimes if I power cycle the monitor as the progress bar is filling it works and I get the MacOS desktop login screen but sometimes not and I have to reboot numerous times before I strike it lucky. I’ve attached my bootleg incase it’s helpful. I’d really appreciate your help on this as it’s mega frustrating. Hackintosher I have one more problem. I have decided to reinstall Sierra just to see if everything will work again following your guide. Well I did get everything to work again except the sleep mode. As far as I remember it worked the very first time I installed it but now what it does is puts only the monitor to sleep. The unit it self will go on for about 30 seconds before going to sleep but then it just wakes up straight away. The monitor will stay in a sleep mode unless you touch something. I have tried overriding the t EFI with the one from your GA-Z270X-Gaming-K5-EFI zip build as well as disabling the wake for network access and power naps and still no luck. Am I missing something?? Uncheck Wake for ethernet access & Enable Power Nap in Energy Saver in System Preferences. Also turn off your wireless mouse if using one as the slightest movement can cause wake. I used a bluetooth USB dongle before and they don’t work really well on a hackintosh. I recommend going with a internal solution like a DW1560 wifi card and getting a PCIe card adapter if you don’t have built in wifi/bluetooth card slot. I have tried both the iMac 14,2 and iMac 17,2 definitions both with the lilu, and nvidiafix kexts files. 1. Press the Apple Button at the top menu bar left corner 2. Select About This Mac 3. Select System Report… 4. Select Graphics/Displays on left side. 5. This will show you your refresh rate are you at 60hz? Next 1. Open Activity Monitor 2. Select Memory. 3. How much memory is kernel_task using if it keeps going up and you see a crazy number like 40+ GB then that’s the problem. Hey! Excellent guide, you’re awesome dude. I’m having this exact problem, but I don’t see the kernel_task in Memory option in the Activity Monitor. Any other suggestion? Nvm! If you install Amphetamine, and allow it to power off displays, the functionality it’s the same. So, your monitors will power off, session will be closed and the PC will keep on working fine, as it will never fully sleep. Merci ! merci beaucoup pour votre guide, ça fonctionne du tonnerre !! I have used your setup, albeit needing to patch the kexts for my 960 EVO NVMe drive. However I keep getting an issue with the onboard LAN connection which toggles from green to red all the time. Opening new tabs in Safari does it. Trying to download something only gets a few KB in before it drops. Total pain in the arse. Any ideas? Forgot to add that all other boxes on the switch are all getting ok connections and internet access it’s just the hackintosh that keeps getting up and down interface. This happens on boot up and even with the new version you list. Ethernet is there, then it goes down. Then it comes back up after a while briefly before going back down again. Anything can set it off including general network (SMB, ssh etc) access. I had this problem with the tonymacx86 Z270 install process. In this instance it fixed itself but USB3 would not work properly. That was using a 14,1 iMac id. With you build process here I get USB3 working perfectly but the network interface cycles and work sort itself out. My only difference from your stock install was to insert the fixes for NVMe using clover configurator. Could I ask what your /Library/Extensions folder looks like? My /Library/Extensions folder is clean with no kexts added. I recommend doing a clean install of macOS on a new partition if you don’t want to delete your current one. Then replace your EFI with the one created in this guide: http://hackintosher.com/guides/guide-installing-macos-kabylake-hackintosh-sierra/ but don’t use tonymacx86; it’s always a possibility that kexts you added to Library/Extensions is interfering with your connection. If that doesn’t work your issue sounds more like it’s hardware related. If it’s on the motherboards end you can try using a different BIOS version then the one you are currently using. I used F4 in my guide you can try F2 or the latest version available. Finally got it working. Performed a fresh install following the install guide to the letter. Still experience the same issues with the ethernet connection. Most annoying. Decided to boot into Linux (Mint 18.1) to check out the network adaptor. The lights were on (and flashing) but nobody home. Linux could not see the adaptor either. Ran lshw command and saw the adaptor as “UNCLAIMED”. Followed the instructions from: https://ubuntuforums.org/showthread.php?t=2350778&s=163e6da5a9751c85d4c44bc313cfc594&p=13600042#post13600042 and the connection appeared and worked. Restarted the machine and booted into Sierra and the connection was rock solid. Not sure what the go is but whatever action that command in the link did it sure got that interface working. Great! So it looks like it may have been a hardware issue after all. A question here. I get random restarts in sleep (not when waking, but sometimes in sleep). Just as a feedback for Skylake 6XXX CPU users. This did not work well for me. It went into restart immediately after going into sleep. I have rolled back, to “stock” with deep-sleep disabled. It still restarts after in not touched for a longer period of time, but at least not every 5 minutes. Hi, will this guide and EFI setup work with the Gigabyte Z270X- Gaming 7? If there are any changes such as I know this mobo has Creative Sound, not RealTek can someone point me in the right direction? Also I want to make my machine dual boot with Win 10 on the M.2 storage which I have already installed. Do I need to create a different BIOS Profile for each OS and load it before booting? Yes it will work someone else also asked about that for sound you can try following https://www.tonymacx86.com/threads/cant-figure-out-how-to-get-creative-sound-core-3d-chip-working.209630/page-2#post-1519058 to get it working. No you don’t need to make different BIOS profiles for Dual Booting; I use the same profile. Excellent guide which I followed and everything is wokring great! I used the Voodoo 2.8.8 hack to get the sound to work. One thing with the Clover Bootloader, my Win 10 disk (M.2) comes up as an option but when I select it rather than the Apple one it just sits there with the blinking underscore and doesn’t boot. However if I quit Clover then Win 10 automatically boots from the M.2 drive. Any idea how to get Clover to boot the Win 10 drive without having to quit it? DDR4 (2133) 16 gbs ram x2. I want to know if the CPU will work with this motherboard? I changed the Timeout to 0 in the config.plist, but the OS is still needing the “Enter” to boot…there’s a way to automatically boot to the OS from the Clover Boot Manager instead of pressing the “Enter” key? Yes there is, but setting the timeout to 0 isn’t going to auto boot. To auto boot you need to uncheck the -1 box. Also I highly recommend not setting the timeout to 0 as you will lock yourself out of Clover. Set it to 1-2 seconds at the very minimum. Can you explain how? Because I’m not being able to make that work, even with 1 or 2 seconds. Set it to 1 or 2 seconds then uncheck the -1 box next to it. has anyone tried 10.12.6 update yet?? If so how did it go any major changes?? smooth update to 10.12.6 even on iMac18,3. The Nvida drives were not working from start but a bit of tweaking in the kext sorted it out. For handoff you need a hackintosh compatible wifi/bluetooth card; handoff does not work over ethernet. Excellent guide! Everything is working well for me, GA-H270N-WIFI, i7-7700K, GeForce GTX 1050 Ti on 10.12.6. I ordered the Bcm94360cs2 and the NGFF(M.2) card, but they won’t arrive for a couple weeks. My impatience got the best of me in Micro Center, and for giggles and $12, I picked up the Asus BT-400, since I read it worked out of the box for others. However, it won’t even list in the USB tree for me. Obviously, I can be patient and wait for the Bcm94360cs2, but thought I’d ask here for any pointers in the meantime. I’ve followed this guide but after install from the USB , during boot it hangs at “busy timeout kextd wait appleacpicpu” and I’ve tried several options from this thread https://www.tonymacx86.com/threads/appleacpicpu-timeout-before-reaching-installer.197482/ but can’t seem to get it working, do you have any ideas? Never mind, it was a typo in config.plist when I applied the NVME patch that was causing it, it’s working a treat now! Thanks so much for this guide, in the past I’ve relied on getting known compatible hardware and using Unibeast and Multibeast without really understanding what those apps were doing, with this write-up I feel like I have more of an understanding and at least have an inkling of where to look if I run into problems. Yea not a problem glad this guide helped. From reading your post it did indeed sound like it had something to do with the NVME patch. Your options are either to delete the APPLE folder in your EFi partition (It will be recreated) or create a new EFI with the latest version of clover following this guide http://hackintosher.com/guides/how-to-make-a-clover-hackintosh-bootloader/ Then transfer over the config.plist and the kext folder. Make sure to backup your EFI so you can transfer by renaming it or zipping it because Clover will replace your existing folder. Clover 2.4 seems to complained about incompatibility with 10.12.6 when I tried to install on my mac. Can you update this post with a fresh install of 10.12.6? Ok. Will try. Just want to say how great it is to see you answering all the questions. Much appreciated! Thank you! Hello! Just a quick question – will this also work with a GA-z270x-gaming 7 ? Hi. I successfully built my first hackintosh using this guide and the machine is awesome. However there are a couple of issues. When I try to boot up from the ssd it runs really slowly and when the startup progress bar reaches around 2/3 of the way the screen goes black and nothing happens.. 🙁 . Not sure what I missed there.. The other thing I’m battling is getting the system to recognize my GC-Alpine Ridge Thunderbolt 3 AddOn card, sitting in pci slot 4. Any input or help would be greatly appreciated. IT works, it bloody works. I love it. thank you. Few issues with the graphic card, but it was resolved. Thank you for posting guide. Installation all seems well, but on first booth when it asked about Network configuration. I put DHCP but it just restart (did a few times with same result). So i decided to skip that, it went smooth. But now i don’t have any internet connection. (I am similar board as yours). Is there any idea how to activate Network? 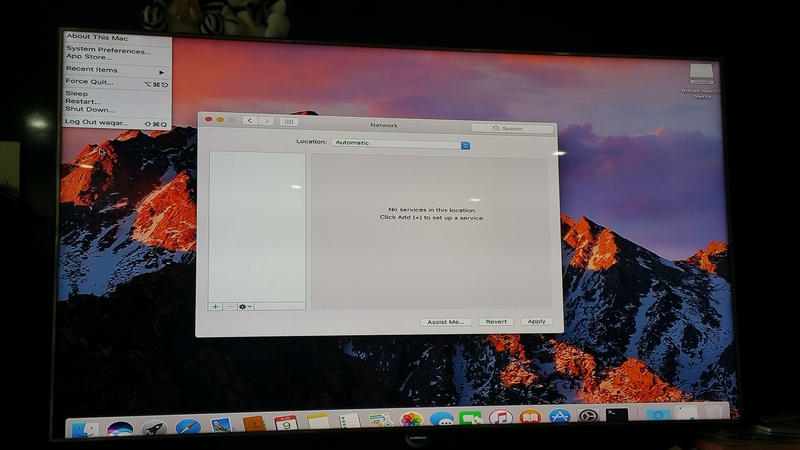 Also another noob question, do i have to download Clover Configurator after installing Hackentosh? As now i need to use perform STEP 3: Configuring the EFI Partition. Thank you for replying so quick. It seems i totally don’t have any network option available. Now i am writing from Windows on same computer and there are no issues (I used Virtual box to prepare USB drive). on another note, is it possible to scale screen? I am trying to use this PC in living room for multiple purpose, but if you look at the screen it need to be scaled. Reinstall macOS without configuring the network. For scaling do you have hardware acceleration with your graphics card?/iGPU It looks all funky. Open Display in System Preferences , what resolution options do you get? Have you tried using a displayport cable? Alright, i will try to install mac again and will take the snap when it show error of network (it keep going in loop to restart unless i don’t skip network setting). Have you overclocked the 7700k? Max, if you are asking me then now. This is brand new PC i just bought to install Mac and everything is stock. You can change the clock speeds just fine if you want. I prefer to undervolt instead of overclock for better temps and lower fan speeds. I have just spent the last day looking at overclocking and reading this made me want to do exactly that!! Another little glitch discovered. The mirroring option icon does not want to show up in the corner when clicked in the Display function.It seems to be showing only for about a half a second but then it disappears straight away. The icon was showing up solid at some point in the past and mirroring was fine as well. It does however work but only via itunes. Any tips on that? Role back the kext’s to the earlier version this is a Gigabyte problem. I followed the guide until installing the nvidia web driver. After installing nvidia web driver fails to restart always. It’s definitely your kexts. Try making sure NvidiaGraphicsFixup.kext is updated to the latest version. I would also update Lilu.kext to the latest version, but that may break audio on Gigabyte motherboards. Also make sure integrated graphics is disabled in BIOS. Just built Hackintosh with components listed below and running OS X 10.12.6 (16G29). Everything work but the ethernet ports. Any suggestions? Really appreciated you post this tutorial. I successfully install the hackintosh. But sometimes will got graphic distortion (very rare, mostly after sleep and wake). And the HDMI audio not works for me, I have to plug in my speaker to the “line-out” of the motherboard. Thanks for a great set of guides – I have everything working fine (almost) thanks to you. However, the GUI overall is slow. GUI performance in e.g. Adobe Lightroom is choppy, the Flurry screen saver renders with very low FPS, and many GUI animations are laggy / choppy. I suspect that the slow GUI performance is due to the IGPU (in my case HD630) not being available to the OS. On your build, do you see great performance in e.g. the Flurry Screensaver with these settings? If not, would you be able to create an EFI with *both* DGPU and IGPU active and check if your GUI performance (e.g. measured by running the Flurry screensaver) improves? If not, can you think of any other common mistakes / tweaks to get full GUI acceleration working? Thanks in advance from Australia. Replying to my own comment in case someone else has the same problem. My mistake was using an 18.3 system profile for my system. Although it fits the CPUs great (18.3 is a Kaby Lake iMac), it (in my case) impacts the performance of the Nvidia Web Drivers. By running a 14.2 system profile instead, graphics performance improved and everything is running as it “should”. After one full day trying several guides I follow yours and everything was perfect at first time. First of all.. thanks for a great job on these guides. I haven’t attempted a mackintosh build in years so noob alert here.. .
I’m running the exact setup in your Z270X Gaming K5 guide except I’m running an amd R9 380X. I inserted whatevergreen .kext as per other guides to help with my gpu. It Installed from USB drive no problem, rebooted to clover, selected boot from drive.. then installed more as normal. After second boot from drive, more install then half way through it hangs. There is some coloured stripes that appear the load bar freezes. Any thoughts on what this could be? Can i try load with onboard graphics instead or do i need to redo install? Yes just boot using the iGPU config.plist file. Also how long is it hanging for? Mine hangs about what feels like a minute to boot on my AMD GPU system. Mine freezes while while booting, I’m not able to successfully boot to OS. Should I remove invidia and amd kexts from the boot loader and rename plist files for integrated graphics and boot successfully? O will I need to re-install Sierra? Has anyone had a go on Hight Sierra yet? I have Gigabyte Z270N Gaming 5 Mini ITX Motherboard with Kaby Lake i770K. I try to install 10.12.6 following your guide however, after 80% install the screen goes blank. I have connected Dell S2340T Touch Monitor thorough displayport. First time builder. Excellent guide. No problems. If you upgrade Video cards do no make my mistake (take the advice above) and reinstall to a reformatted drive. Can you please post a guide how to update to High Sierra or do you fill it is too early to dig into it? I’m working on a update guide right now that will be out later. Thanks a lot. As I am on Nvidia, so I’ll probably have to wait here. One more question – are you plannong to do a guide with Intel NUC Skull Canyon? I got my hands on one with i7-6770HQ and it is a beast for day to day work and in a super-tiny pack! Would be really cool if you could do your super-friendly install guide! Hey so I followed the guide and installed mac os sierra on to my Hackintosh with this motherboard and pretty much got everything except that after using it for less than 20 minutes my keyboard and mouse goes unresponsive and the os freezes which forces me to restart the computer by using the reset switch i dont know if there’s a fix for this particular issue I have all the kext files and Nvidia web drivers up to date. I am using a 6700k with this motherboard and a GTX 1060 for graphics. Anything on this issue would help a lot. Sounds ike it could be a graphical issue? Did you disable integrated graphics completely in BIOS? and Uncheck Inject Intel in Clover Configurator? Thank you for your fantastic guides. I was able to run MacOS on a Z270MX-Gaming 5 with GTX 1070 in less than 4 hours. System is perfectly stable under Sierra. When the freezing happens is it totally frozen or just lagging? If lagging click Disk Tab under Terminal and see how much memory kernel_task is using. Clear out ig-platform-id. I’ve had no problems with GTX 1050 Ti freezing. Will this guide work for High Sierra? I have all my parts delivering today and was hoping to do a clean install of High Sierra. Everything worked awesome following this guide with Z270MX-Gaming 5! I’m quiet a bit jealous as I wanted to build the exact same machine before I saw your guide. So I only have one thing to say : what a great choice of components and style 🙂 And I will for sure follow the guide step by step and donate. Sorry, the initial post is not clear. but with the z270mx, there is no DP in so I don’t know what to do. Hi , Can I install with same Bios settings, a new Hard disk and Windows 10?. If I use a boot camp to format a windows 10 usb , will it work. Windows can be installed with the same settings the only thing I could see being a problem is the XHCI Hand-off setting but since Win10 comes packaged with USB3 drivers I don’t think so. Thank you sooooooooooooooooo much ! I tried other tutoriels but you’re work is so perfect and easy… Thank you, thank you, thank you !! What do I need to change in the EFI folder on this page to install 10.13.1 on a new hard drive? This is my 2nd Hackintosh fellowing this guide. Every thing works perfectly on Sierra included HDMI audio with VooDooHDA. Benchmark is a little higher than iMac Pro 2017. 3rd Hackintosh is planned. Thank you. Dude, this is the BEST guide on the net. Due to some hardware issue in my previous build (manufacturing fault) I had to reset cmos shorting and battery, setup up the bios but still woouldn’t boot, spent three days trying to get it up and running, nothing, then I came across this guide and got it working under an hour. I am now transferring files from TM (not settings) and so far it’s all good. How com I couldn’t find this perfect and easy guide in the forums? tonymac and insanelymac? Does HDCP content and DRM in iTunes work on this build? First of all: Thanks for the guides! Never set up a hackintosh before … your guides helped me a lot! I bought the gigabyte z270mx gaming k5 and after some tinkering got High Sierra 10.13.1 to work (currently on the integrated GPU). However the sound is not showing up in the system profiler. I also tried the channels 1,2,5,7 – no luck. If use the latest AppleALC 1.2.1 I get stuck in a reboot loop with some stacktrace and last information I can see (really quick) is about libcrypto.so. Does anyone have the same problems / an idea how to fix it? Got it to work with AppleALC 1.2.0 ! Yes some Gigabyte Z270 motherboards have trouble with certain versions of Lilu.kext/AppleALC.kext glad you were able to fix it. I’m wondering when you downloaded the AppleALC 1.2.1 kext. The github says that if you downloaded it before November 12, that you should redownload, since they uploaded a wrong binary. Can you please share your EFI folder (or the config so i can do a diff). I am having trouble detecting SSDs with the default Unibeast created drive. My problem with the SSD was that the disk was new and never formatted. FYI. I just brought up my hackintosh with this motherboard. I was experiencing very sluggish performance. I have an LG 3440×1440 display. The refresh rate was 60 Hertz. I changed to 30 Hertz and now everything is snappy. Is that with a dedicated GPU or using your iGPU? I plan on using a 3440×1440 monitor when i get my hackintosh working. Hopefully, this wont be a motherboard specific problem. Also, does the 30 hertz refresh rate make a difference? I’m using EVGA GT 730 2GB GDDR34 with the latest Nvidia driver. I did the audio installation procedure, the first time worked perfectly, but after I rebooted it did not work anymore, I tried to redo the procedure more unsuccessfully. The first time I used ID 11, then I tested with all IDs (1, 2, 5, 7, 11). I’m having the same issue as Pete after at least 10 attempts of installations. Initially the pre-installer was hanging/freezing at ~75%, but as mentioned earlier replacing the lilu & IntelGraphicsFixup kexts got me to the installer screen where I was able to chose to install to my ssd but after rebooting to the ssd I’m first greeted with the “An error occurred while verifying firmware. Quit the installer to restart your computer and try again.” and if I do just restart I’m given the “The path /System/Installation/Packages/OSInstall.mpkg appears to be missing or damaged. Quit the installer to restart your computer and try again.” endlessly. Removing EFI/Clover/Drivers64UEFI/EmuVariableUefi-64.efi did not do anything and neither did toying around with various SMBIOS configurations. Also there was a thread mentioning they removed all but one Ram stick and this solved their issue but alas this did not work either. Any further suggestions would be greatly appreciated. I also at the same time set SMBIOS to match an I5 Mac in clover configurator, since I did this at the same time as creating the new boot media I’m unsure if it actually aided in allowing me to install correctly but I felt I should mention it. After the installation “completed” I was no longer able to see the hard drive as a boot option in clover with any of my boot medias; apparently High Sierra will automatically convert SSD installations to their new Apple File System (APFS) instead of HFS+. In order to “see” the freshly installed OS I had to copy apfs.efi to /EFI/CLOVER/drivers64UEFI/ so that the bootloader could read the APFS format. Once I did this I was at long last able to boot directly into the Newly installed OS. Hope this helps someone, now I just need to figure out how to get the optical audio out to work. THANK YOU SO MUCH . Your comment was the solution to my same problems. Very helpful and a life saver you are! Cheers mate! Would your EFI work with the Z370 version of this board? I assume they run a very similar BIOS. This is great, thank you so much. My only issue so far is that my external hard drive is ejected during sleep. Any ideas? Change your BIOS version and don’t use the red USB port. My system report shows that the USB 3.1 bus is working though, does yours not? I will give it a shot though. I tried using a USB 3.0 port instead, same deal. I’m still wondering about the USB 3.1 status of this build though. My system report recognizes the USB 3.1 bus. Is there a way I can test that it’s working properly? I have determined that this problem *only* occurs when I have XMP enabled in the BIOS. Weird! …black screen and frozen cursor. I am wondering if this guide should be updated to recommend an iMac 18,1 SMBIOS, since the 18,x series has Kaby Lake. Congratulation for your guide and thank you. I was able to build my 3rd hackintosh. On this configuration, everything works for me with Sierra including sleep but not hibernation. How can I make hibernation works or how can I disable it? I apologize in advance if this question was already asked, I did skim through to see if it was already answered. I would like to convert it to a Hachintosh. Thanks! Hey Hackintosher, after my last OS update 10.13.3, my G5 hackintosh build (completed successfully following the above guide) broke. When restarting it gives me a Kernel Panic message, the only thing I can manage to do is safe booting, but once in the system seems like I can’t mount the EFI partition to fix any damage. So I’m going to make a fresh install with High Sierra, do you think downloading this guide’s EFI folder and filling it with the kexts from the new High Sierra guide’s EFI folder will work fine? Or should I do vice-versa? Did you manage to install high Sierra successfully? Which configuration files did you use? Gaming K5, i7 7700, Hyperx Fury 16GB 2400Mhz, I am installing MACOS High Sierra. Hi Hackintosher..do you still have this build? Was wondering if you do if your rear USB3.2/USB-C ports work normally. I followed this guide with your High Sierra installed and everything works except when I use those two ports…when I shutdown, it just reboots…Shutdown only works normally if I remove devices from those two ports or only use the USB3/2 inputs. Hi..i followed this guide but instead installed 10.13.4. Everything seems to work but occassionally (not all the time) my ethernet connection goes down after waking up from sleep. I have to reboot to get it working again. I noticed I have both AtherosE2200Ethernet and IntelMausiEthernet in my Kexts/Other folder. Should I be using both or just one of them?